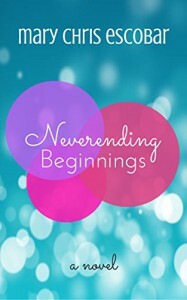 Neverending Beginnings basically takes that idea of "What if you got a do-over?" to an extreme. This book follows Kate (not Katherine) as she gets a chance, for who knows what reason, to re-do the previous two weeks of her best friend's wedding. Kate and Amy, before the wedding, were actually quite fine as far as friendship goes. However, you'll find out quite quickly what kind of lead to their fight and why things are tense between them (as well as why Amy in just tense in general). And at first, as with most thing, getting a do-over(or a few do-overs) for a completely idiotic moment seems like an awesome beyond awesome idea. But you find out soon why this can equally be a bad thing. This book follows Kate as she tries to fix her relationship with her friend, Amy, her love interest, Ben, her ex, Jack, and come to a bit of, I suppose, resolve about the passing of her mother. It was interesting to see how she had to go about fixing certain things or how you would think that what she did fixed things but really made them worse. I did find this funny and cute. It was definitely on the lighter side of the women's fiction/chick-lit scale I'd say. While there was a small bit of a dark theme with the passing of her mother, it wasn't on the lines of reading Jojo Moyes, Dorothy Koomson, or Liane Moriarty. Most of the book had a real lightness to it, and I think that did help a lot. It did make it really, really fun to read because of that. My only flaw or criticism of it I guess would have been to get a bit more clarity or knowledge on why Kate got to repeat that time, especially for the amount of do-overs that she got. I felt kind of having a bit of an explanation would be have been nice for that.